We are really lucky to have you as our roomie; come hang out with us this February 14th and let us show you how much we care. February might be the shortest month of the year, but we've packed it full of promotions for you to cash in big! 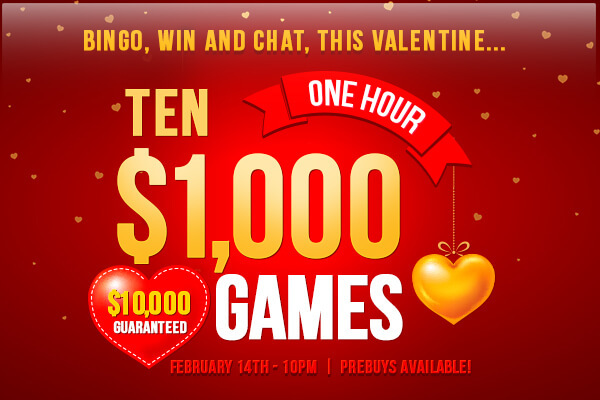 Join AmigoBingo, CanadianDollarBingo and BingoAustralia for a Valentine’s event like nothing before. Why don't you... treat yourself to fantastic Valentine's Day? Pre-Buys Available NOW! Want to be the first to know about our newest promotions and giveaways? Follow us on our Canadiandollarbingo facebook page to stay up-to-date with all the latest bingo happenings. This entry was posted in Blog on Feb 14, 2018 by Canadian Dollar Bingo.